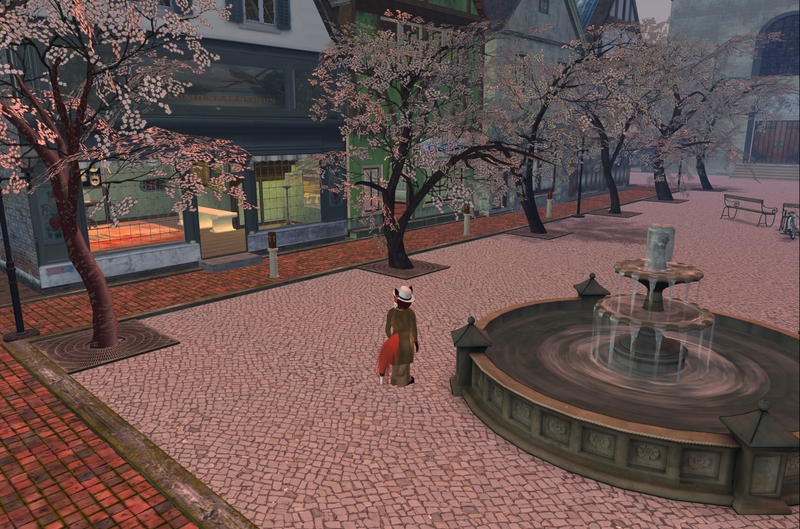 Communities in Second Life are run in different ways. Some are run only by the estate manager who does things only his or her way and won't listen to feedback. Others take on one or more managers and make an effort to listen to the local residents. 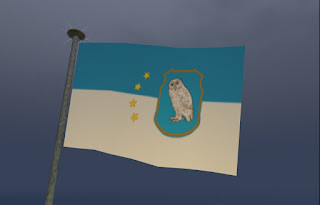 But the Confederation of Democratic Simulators has an actual government and a set of rules in which it's citizens have a say in how things are run in the community. 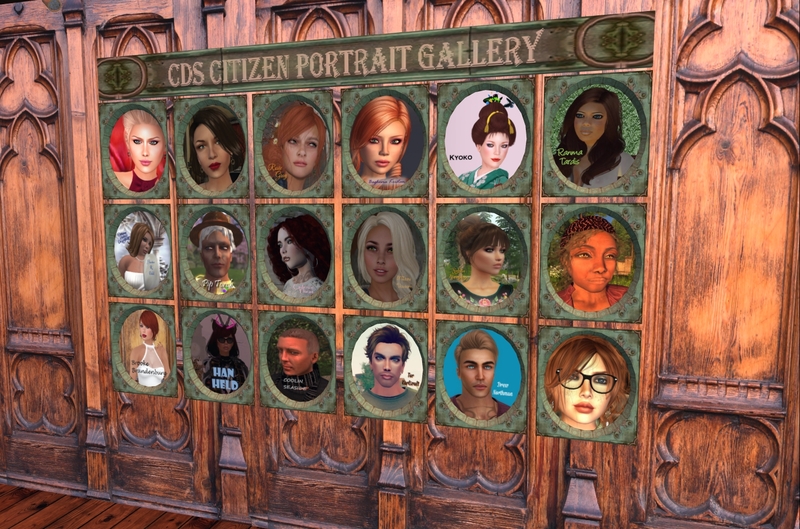 While the CDS stands out in other ways among regions in Second Life, such as it's hilly landscape, it is the democratic process there that it's known by. I had a few words with two of the region's prominent residents, Museum curator Hannah Marie Bloodtempestwolf (Han Held), and the CDS Chancellor Rosie Gray. I met up with Hannah first. "We're self-governed," she told me, "We have a representative assembly that makes and oversees our policies, a chancellor who assists with that, works to publicize the CDS and sets policies in a more autonomous way, and the "scientific council" which is our judiciary which makes sure the other two branches act within our constitution, basically settling disputes. Right now we're setting up for the 29th election of the RA and Chancellor. Folks will be campaigning for office from may 5th until the 12th. Then the polls open on the 12th and close on the 19th, and the next term (the 29th) begins on May 19th. The cool thing is that anyone can walk in, become a citizen and end up in the government. Heck, I did." What are the requirements for citizenship in the CDS? "That's easy. Citizenship is based on property ownership," Hannah told me, "We have different sizes of parcels for sale, all of them give the benefit of granting citizenship. One becomes a citizen by renting a parcel with us (smile). Election qualifications are a little more complicated; but not much more. Basically if you became a citizen before the election deadline, you can run for office. If not, you have to wait for the next election. That's all.. The Scientific Council also handles our elections, and the dean hands out a notecard with the dates and qualification requirements on it." She handed me a copy of the card, which had information for the next Representative Assembly election, the 29th, and the election of the Chancellor. The qualifications for who could run for office and vote were determined on April 2nd and April 12th by a census of the landowners at the time. The deadline to declare running for office was May 2. 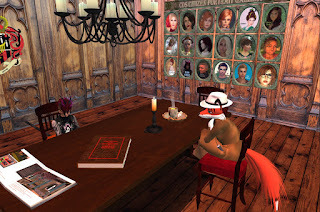 The date for posting the official list of candidates by the dean was listed as May 4, though inworld group notice and on their Internet forum, with the stast of the campaign on May 5. The election campaign will last a week, and the polls open at Noon SL time on May 12. To give time for the citizens to vote, the polls will be open for a week when they finally close at Noon SL time on May 19. On May 26, the dean will announce the names of the new Representative Assembly and Chancellor. "As you can see from that," Hannah told me, "there's a period **before** campaigning where folks can declare themselves to the SC. It's after May 5th that the debating, etc., starts up." I asked what were the issues for this election. She answered, "At this point we've hashed out a lot of issues, and we're going over some of the old laws and trying to make things run more efficiently. We have a couple of bills before the RA that address how we handle buying and selling regions, for instance. ... basically seeing if we need to change things. There's some ambiguity about dates and things like that. It's all kinda arcane. There isn't huge over-arching issues at the moment, though there have been historically. At this point, citizens have their pet concerns that they run on. We won't know until the campaigning starts and people say 'I'm Joe Candidate, vote for me because X.'" I asked what issues there were in the recent past. Hannah answered, "Things like establishing a commission, starting a history group that talks about the history of the CDS. There was the history group. There was the replacement of the historic Rathaus with a new, more efficient and prettier Rathaus. Before that there was the decison to buy Friedsee, our latest region. Then on the first RA I was on, we had to decide what theme the region would have and how it would be laid out. Other issues are things like starting a marketing campaign. 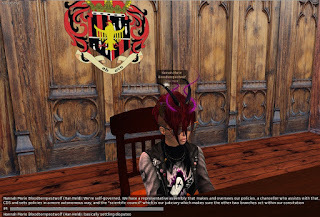 I wanted ads on SLU (a popular SL forum), so I ran on that. I was elected and we put some on there. And I retired. *laughs*" "A lot of our issues are local;" Hanna told me, "though one representative has pushed for us to have Pride marches and marches against prejudice. 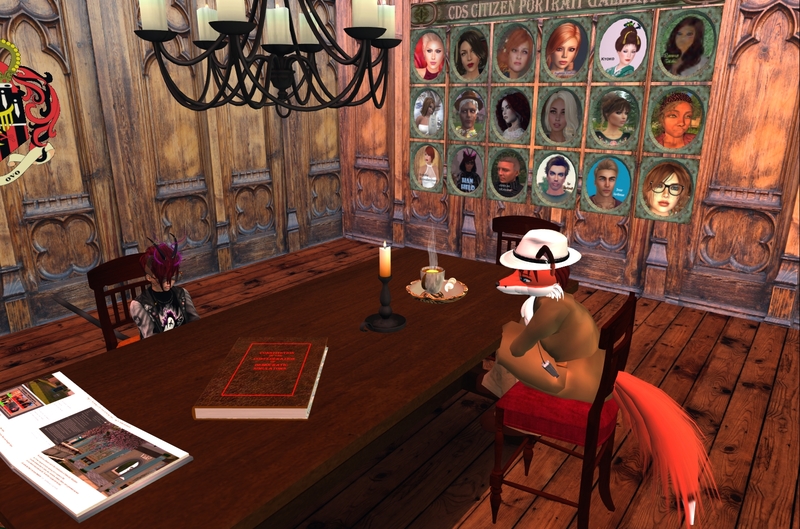 We also had a celebration of Women in virtual worlds a couple of months ago." I asked if gay pride and prejudice were issues in the representative's home area. "No, it was more of a reaction to the rise of the Alt-Right, I think," she answered, "It was about the same time as Trump's election, a couple months later, the march against hate, I mean." I then brought up that US elections in recent years have gotten a bad reputation, and asked how well-mannered elections in the CDS were. Hanna answered, "Well, before I got here in 2015 there were elections that were very combative. They reflected things that were going on at the time. I'm thinking of circa 2010 or so when we were considering a merge with another estate. There was a culture clash, both of literal cultures but also management styles as well. That's history, though. In my time the elections have been a lot, lot more quiet and nearly uneventful." I asked more about the culture clash, and she told me, "The estate we were considering merging with was Al Andus, which was set up more in the style of an Islamic caliphate, or so I understand. I don't think there was religious differences per se as much as 'this is what we consider a quorum' kind of diffences. Of course, that was like, five or six years before I joined the CDS. In the end, the CDS and the citizens of Al Andalus voted against merging. There was a lot of heat about it at the time, from what I understand. Long story short, two groups that 'have always done it that way' didn't want to budge on how things were ran." Asking about more recent elections, Hannah told me they weren't nearly as heated, "Not since Feb 2015. *grins* At this point, most of us have known each other several years and most things have been hashed out. We have differences of opinion, but nothing terribly radical, as far as I can see." That was about all Hannah had to say, wanting to give Chancellor Rosie Gray a chance to speak. The three of us would meet later, the details in the next article. Correction: Al Andalus, which was named after the Muslim kingdom in what is now Spain, was originally misspelled as Al Andus.